Living Fuel has made a huge difference in fueling me to win a place on the Olympic Triathlon Team,” Huerta said. “I am depending on SuperBerry Ultimate, LivingProtein, SuperEssentials Aminos and all of the other amazing Living Fuel products. 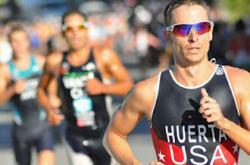 Manuel Huerta and Hunter Kemper won spots on the 2012 U.S. Olympic Triathlon Team in San Diego Saturday. Huerta placed 9th in the 1,500-meter swim, 40-kilometer bike ride, and 10-kilometer run course. Kemper, who has competed in three previous Olympic games, finished 5th. Huerta is also a Living Fuel champion and depends on the nutritional power of LivingFuel products to give him everything his body needs to excel during training and racing. Huerta has an unusual training regimen that includes sleeping in an active volcano in Costa Rica. He works out in Cartago at almost 5,000 feet above sea level, then drives up to the volcano at about 7,000 feet to sleep. Huerta credits sleeping at the higher level with better performance. Manny Huerta was born in Cuba and emigrated to the United States with his family when he was 13. He became a U.S. citizen in 2000 and lives in Miami, Florida. Huerta entered his first triathlon in Cuba at the Cuban IronKids National Championships and won it. Some of the recent highlights of his career so far include becoming a member of the USA Olympic Triathlon Team, USA Triathlon National Team, 2011 USAT Olympic/ITU Athlete of the Year and being the 2011 Pan Am Games Silver Medalist. KC CRAICHY is Founder & CEO of Living Fuel – The Leader in Superfood Nutrition, and the best-selling author of “The Super Health Diet – The Last Diet You Will Ever Need” and of “Super Health - 7 Golden Keys to Unlock Lifelong Vitality.” He is a health advocate and expert on natural health and performance nutrition. His extensive study of leading-edge health research and collaborative work with top medical and nutritional practitioners and researchers to solve his wife’s health problems led him to the founding of Living Fuel, Inc. KC is committed to changing lives through nutritional and multi-media lifestyle education combined with leading-edge high impact superfoods. He also serves on the Clinical Nutrition Review Board (the certifying body of the International and American Association of Clinical Nutrition). KC lives in Orlando, Florida with his wife Monica and five children.